Time to breathe a sigh of relief. Nebraska needed a win. A team that won 21 games a season ago had dropped five of its first seven to begin the 2018-19 season and had a 6-0 Kansas squad in the building. Through the first 15 minutes of the game, Nebraska had almost as many turnovers (12) as it did points (13). Thankfully for head coach Amy Williams, Kansas’ offense struggled just as much and let Nebraska hang around. When the Huskers finally tightened the screws offensively, they pulled away. A 15-2 run to close the first half gave NU a lead it wouldn’t give back and a 58-52 win it badly needed. “All of the hard games we’ve had to this point, all the challenges we’ve thrown at our kids, they’ve found some ways to kind of grow through that and come away with a really big win,” Williams said after the game. Relief was a pretty common emotion amongst the Huskers. Relief to be back home after five straight games out on the road. Relief to get back in the win column after four of those five ended in defeat. Relief to get a little bit of “mojo” back. Kansas’ head coach, Brandon Schneider, felt like Nebraska was a team still searching for the magic it had last season. He praised freshmen Sam Haiby and Ashtyn Veerbeek and said the Huskers are another NCAA Tournament team this season if it can get back to itself. And that’s in spite of the record. “I think we’re still trying to find ourselves,” Williams said. Senior guard Kristian Hudson, Hannah Whitish’s primary backup at the point, is out with a foot injury. That absence thrust Haiby to the backup point and off the wing where she’s spent most of her time. Center Kate Cain is still trying to gain some consistency. Nebraska has five freshmen it’s trying to incorporate into a rotation that returned four of five starters from 2017. Defensively at least, things started to come together for Nebraska against the Jayhawks. Senior guard and leading scorer Jessica Washington — who came in averaging 18 a game — was ice cold from the floor and only supplied six points on 2-for-16 shooting. 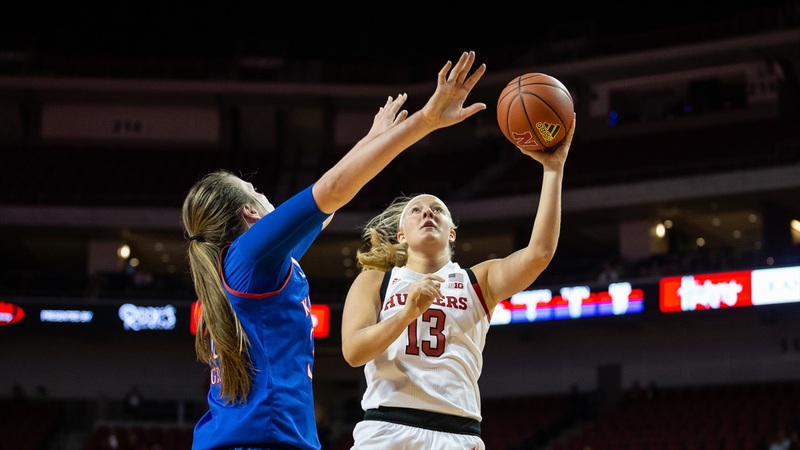 Forward Taylor Kissinger said it was important for Nebraska to show help but stay home on shooters, knowing Kansas’ proclivity for kick-out 3s. Which meant a bulk of the defensive gameplan fell on the shoulders of Cain and Veerbeek in the middle to help early on penetration and be there to, at the very least, alter. Nebraska blocked 10 shots and Veerbeek had a career-high three. Gameplan accomplished. And Nebraska did well to make sure Kansas wasn’t getting too many extra opportunities. Williams has preached rebounding for the entirety of her tenure in Lincoln; it’s been even more important this season after last year’s struggles and Wednesday marked NU’s best performance on the year in that regard. The Huskers dominated the battle on the boards 64-43 with every single member of the team grabbing at least one board. Veerbeek, again, had a career-high with 11. So much so that Veerbeek got the Huskers’ “Top Dawg” chain after the game, which she wore around after. Think of it like Miami’s turnover chain in football, except this one goes to the Husker who did the dirty work, set screens, rebounded and played assignment-sound. Veerbeek had perhaps the best game of her young career. But when this one began, it looked like the Huskers were in for a not-so-rosy night. Things were tied at 11 after the first quarter with Nebraska’s offense looking completely out of sync. Nebraska ended the game with 22 turnovers, 15 of which came in the first half. But with 4:33 to go in the second quarter, Kissinger hit a triple, three of her 11 points on the night. It set off a 26-5 run for the Huskers that closed the first half and opened the first 7:34 of the second half. During that span, Nebraska gave the ball away just three times. “Funny how that works when you’re not handing the ball to the other team and you give yourself a chance,” Williams said with a grin. “I thought right there we were able to play with pace. Nebraska didn’t shoot it drastically better than Kansas (33 percent from the field) and the turnovers were something Williams addressed with the team in the locker room, but the feeling is all positive right now.